In Richard Linklater: Dream Is Destiny, filmmakers Louis Black and Karen Bernstein explore the career of independent director, Richard Linklater. Black talks to Linklater about what inspired him to make such movies as Slackers, Dazed And Confused, School Of Rock, Boyhood and The Before Trilogy. Meanwhile, the documentary hears from Linklater’s family, friends and colleagues - featuring interviews with Ethan Hawke, Julie Delpy, Matthew McConaughey, Jack Black and Jonathan Demme. as this documentary is a cinematic love letter to one of my all time favourite directors. However, Linklater fan or not, there is much to enjoy here. The warm friendship between Louis Black and Richard Linklater is lovely to watch. We get a real insight into the director as he shares the handwritten notebooks of his youth and talks about his hopes and frustrations. Richard Linklater: Dream Is Destiny begins at the beginning - with Slackers. The film explores just how, with little experience and a minuscule budget, Linklater made Slackers - a movie that hit a cultural nerve and attracted significant critical acclaim (Roger Ebert, whose reviews are featured in the film, described Slackers as “rhythmic and soothing — and funny”). We watch Linklater acting in Slackers in a scene where he talks in the free-flowing style that he has since utilised throughout his career. It is wonderful to see Linklater as a fresh, young actor/director. Slackers was very much a team effort with input from many of Linklater’s Austin Film Society colleagues. Interestingly, however collaborative the movie felt to all those involved, the project always belonged to Linklater. Bernstein and Black’s documentary includes many illuminating to-camera interviews. It is fun to see Jack Black recall his experience working with Linklater. The actor remembers just how excited he was to witness the process of one of the world’s most exciting directors. However, he soon realised that Linklater’s big secret is… hard work. Ethan Hawke and Julie Delpy discuss the significance of The Before Trilogy (my favourite film trilogy) and Matthew McConaughey, who made his big screen debut in Linklater’s Dazed And Confused, explains how much trust the director inspires. Meanwhile, it is fascinating to hear Linklater talk about both his successes and the more challenging times in his career. This is a director who has managed to maintain his independence from Hollywood without turning his back on the mainstream movie industry. Some of the most poignant moments in the documentary come when discussing Linklater's most ambitious project to date - the wonderful Boyhood. It still feels incredible that Linklater managed to complete a film shot over 12 years. While no one would question his work ethic or commitment, getting the investment necessary for such a project feels nothing short of a miraculous. It is, therefore, a real testament to Linklater that Boyhood, like the majority of the movies in his career, stayed true to his vision and emerged as such a beautiful, authentic and moving film. What is your favourite Richard Linklater film? I recently wrestled with that question myself and finally wrote a post here on my top five Richard Linklater movies. 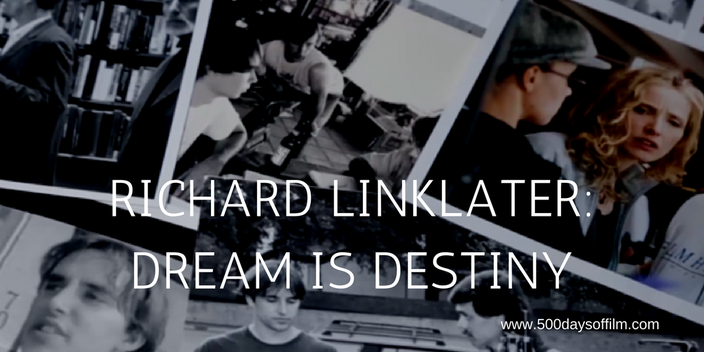 Have you seen Richard Linklater: Dream Is Destiny? If you have, what did you think about this documentary? I would love to know, leave me your comments in the box below!